Re: TVC General Discussion Thread. That's a good pack. I got that years ago and lost all the little pistols to the troopers over the years, but finally found them all/found replacements (thanks to the SL lockers and weapon packs). Now they are some of my favorite clones. Yeah. I may use some extras I have from those and make some custom weapons and gear. I have no issue cutting up (extra) weapons, but I do with figures. Meh, it would be more fun for me to make them myself. Yeah. I'm thinking about making something, but don't know what yet...maybe the navy Commando gun in TFU? Anyone hear that the TPM wave has been found? They were supposed to be released early next year, but someone in Arizona (US) found them early. This was recent. I think stores are entitled to sell them when want unless a specific date is told to them, like Midnight Madness '08. So what figures are you wanting from this wave? me, Dofine, Battle Droid, Obi-Wan, Maul, Naboo officer, and that's it. If Sidious would of had an alternate "deformed" head, I would get it. do you open yours or keep them carded? I open figures, mostly. Few I keep carded, like TVC Cody, 501st Stormtrooper, TVC Ponda Baba, and a few others. I'm not like that. 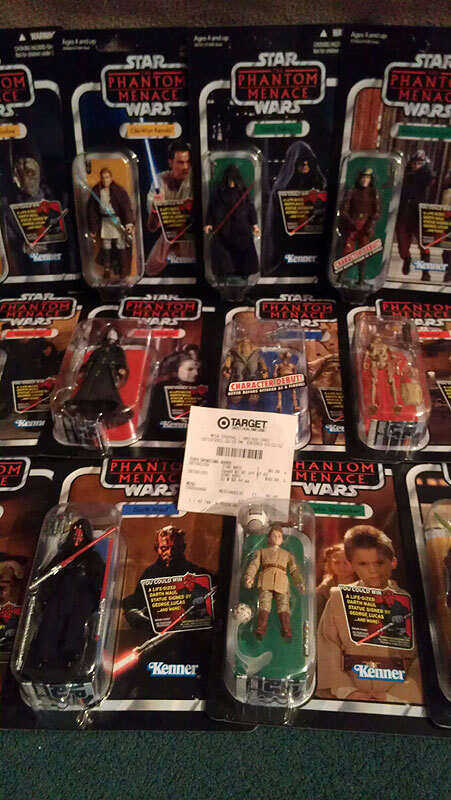 I have many rather rare figures I bought carded (RFT, Bastila, Fordo, etc) and unpackaged them. I wasn't around then, even though I do love the vintage cardbacks. I may get them all out, cut off the bubbles, and hang them up. Should I do that?